Whether you’re having a girl’s day in, a fun date night or a solo Valentine’s a romantic film is always a special way to keep entertained. And, for those who love classic movies these 10 films from the Golden Age of cinema will not disappoint. The 1930’s was a revolutionary era for sound and color so we’re highlighting this unique decade. 1. 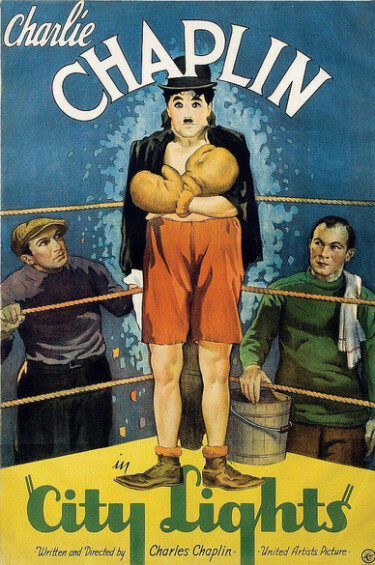 City Lights (1931) – Charlie Chaplin directed and starred in this silent film about a tramp who falls in love with a beautiful blind girl with financial troubles. The tramp’s tenuous friendship with a wealthy man allows him to be the girl’s benefactor and suitor, and he’s instrumental in the young woman having surgery to restore her eyesight. Towards the end of the movie, when the blind girl’s sight comes back and she and the Tramp meet again their touching encounter will melt your heart. 2. 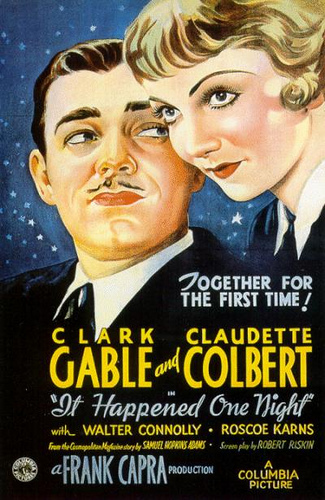 It Happened One Night (1934) – This Frank Capra romantic comedy made the term “sweeping the Oscars” popular, becoming the first film to win in five major categories. Spoiled heiress “Ellie” Andrews (Claudette Colbert) marries a fortune hunter against the wishes of her wealthy father, who forces an annulment. Ellie runs away to search for her man, but ends up boarding a bus with an out-of-work newspaper reporter. As to be expected, a blossoming love develops between the two, but in a series of events, Ellie thinks the reporter is not interested, finds the man she’s been looking for and seeks to marry him. You’ll have to rent this classic film to see how the rest of the story unfolds, but it does get complicated. 3. 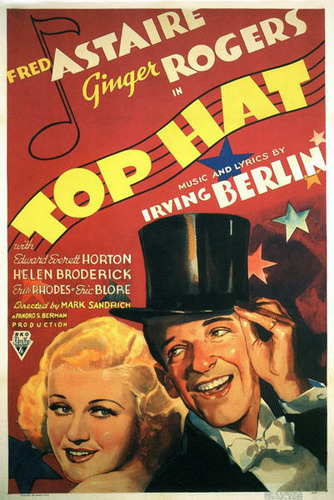 Top Hat (1935) – This screwball comedy is the most successful film of Fred Astaire and Ginger Rogers’ pairing. The movie is filled with singing, dancing, romance, comedy, high-style, and mistaken identity. When Jerry Travers meets the beautiful, Dale Tremont, he’s immediately smitten. Unfortunately, Dale’s affections chill when she mistakenly believes he’s her best friend’s new husband. She’s so disgusted that she agrees to marry another man. The question is, will she find out Jerry’s real identity before she marries a man she doesn’t love? 4. 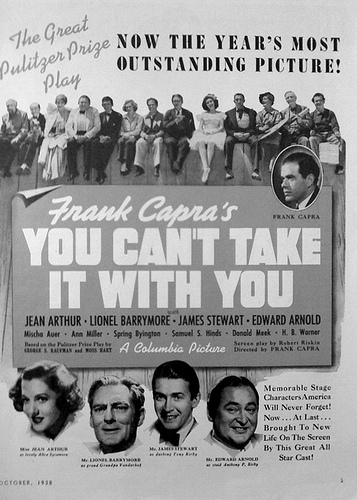 You Can’t Take it with You (1938) – This Frank Capra, Academy award-winning movie is the story of Tony Kirby, a man from a family of rich snobs who becomes engaged to Jean, a good-natured lady, from an eccentric family. Tony’s pretentious mother and wealthy banker father strongly disapprove of the relationship even though Jean is the only sane family member from her eclectic bunch. When the Kirbys are invited to dinner to become better acquainted with their future in-laws, things do not turn out the way Alice had hoped. You don’t want to miss one moment of what happens at this family dinner. 5. 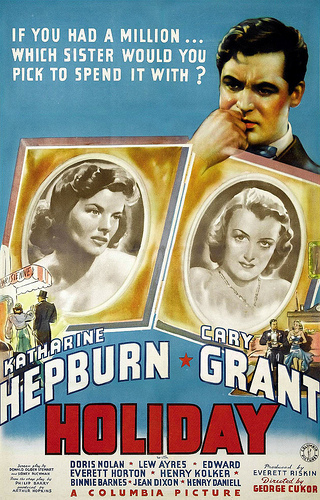 Holiday (1938) – Believe it or not, this is the third of four films that starred Katharine Hepburn and Cary Grant. It’s the quintessential, boy meets girl; boy meet’s girl’s sister and boy falls in love with his girl’s sister film that have spawned hundreds more films with a similar premise. Free-thinker, Johnny Case (Cary Grant), has found the girl for him, Julia Seton (Doris Nolan), the spoiled daughter of a millionaire, and they are set to marry. When he meets Julia’s down-to-earth younger sister Johnny must make a tough decision. 6. 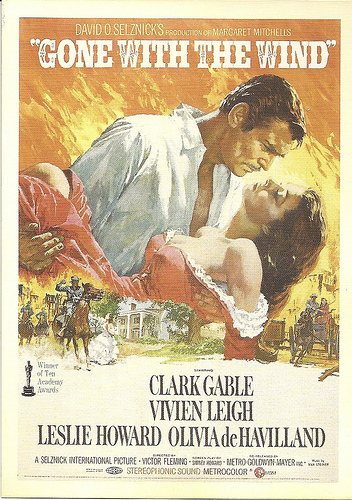 Gone with the Wind (1939) – This film is considered one of Hollywood’s finest movies of all time. The chemistry between Clark Gable and Vivian Leigh is undeniable and enough to keep you intrigued long enough to sit through all 238 minutes. 7. Love Affair (1939) – This romance movie was so popular that at least three more versions were made after its success. 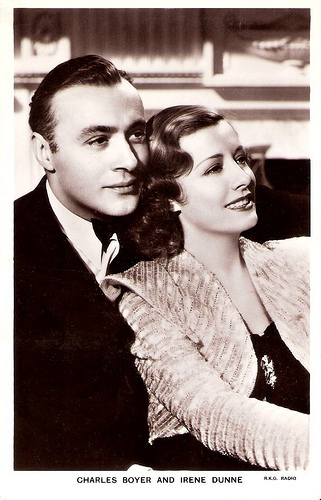 French painter Michel Marnet (Charles Boyer) meets American singer Terry McKay (Irene Dunne) and both are already engaged to other people, nonetheless, they fall in love. They make an appointment to meet six months later on top of the Empire State Building. However, when tragedy strikes it doesn’t seem likely that their love affair will continue, or will it? 8. 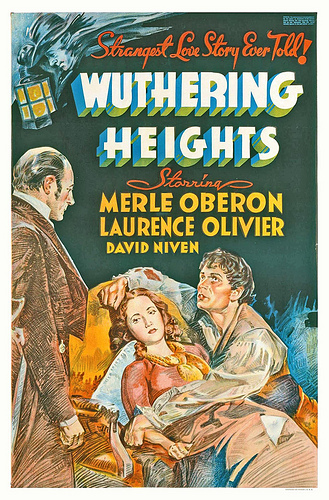 Wuthering Heights (1939) – The story centers around Heathcliff and Cathy who, despite a profound love for one another, are forced to live apart. The pair first meet as children when Cathy’s father brings the abandoned boy to live with them. When her dad dies several years later her brother, now the master of the estate, forces Heathcliff to live with the servants and work as a stable boy. The barrier of class comes between them and Cathy eventually marries a rich neighbor. Heathcliff goes away, returns years later a wealthy man, but it may be too late. 9. 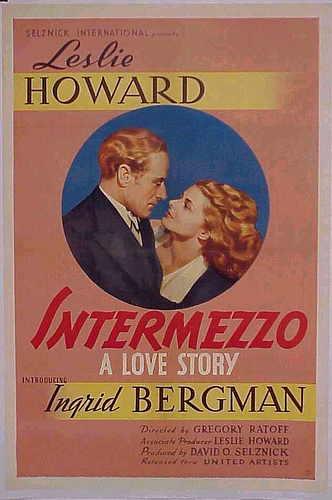 Intermezzo: A Love Story (1939) – A concert violinist takes an interest in his daughter’s piano teacher. He invites the teacher to go on tour with him, and they begin a love affair. The father decides to leave his family, but a tragic car accident changes things forever. 10. 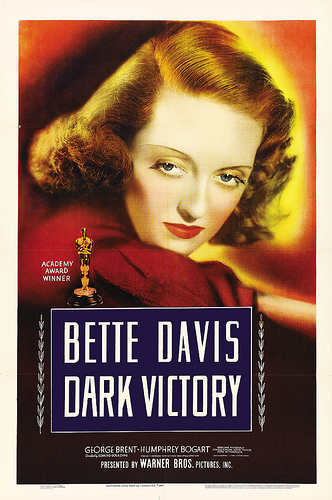 Dark Victory (1939) – Socialite Judith Traherne (Bette Davis) lives a lavish but emotionally empty life. Riding horses is one of her few joys, and her stable master (Humphrey Bogart) is secretly in love with her. Told she has a brain tumor by her doctor, Frederick Steele (George Brent), Judith becomes distraught. After she decides to have surgery to remove the tumor, she realizes she is in love with Dr. Steele, but more devastating medical news may thwart her new relationship, and second chance at life. This is the first in our romantic movie series. Stay tuned for our top romantic films from the 1940’s! Great list, I’ve been wanting to watch some of these and this gives me a good reference. I started watching a few other classics and I’m kind of getting into them. Happy Valentine’s day! I love this list! They sure knew how to make movies back then didn’t they.? My favorite is still Gone With the Wind. Looking forward to your 40’s list.